..... The working and strength characteristics of an epoxy system are dependent on the resin, the hardener, and on the amount of each in a given mixture. Epoxy systems are engineered for a specific ratio of resin and hardener. It is quite important that the proper mixture be obtained. An accurate balance or ratio pump must be used to accomplish this. A drawing of an inexpensive ratio balance is included in these plans. The mix ratio accuracy is particularly important with Safe-T-Pox. The 5-Min. can be adequately rationed by merely pouring a blob of part A in a cup and adding a blob of part B that looks the same volume before mixing. Never eyeball estimate Safe-T-Pox, always carefully use the balance or pump. .....Epoxy resin and hardener are mixed in small batches, usually 6 ounces or less, even in the largest layup. The reason for small batches is that, in large batches, as the hardening reaction progresses, heat is generated which speeds the reaction, which causes even more heat, which ends up in a fast reaction called an exotherm. An exotherm will cause the cup of epoxy to get hot and begin to thicken rapidly. If this occurs, throw it away and mix a new batch. The small volume batch avoids the exotherm. For a large layup, you will mix many small batches rather than a few large ones. With this method you can spend many hours on a large layup using epoxy that has a working life of only a few minutes. If the epoxy is spread thin as in a layup its curing heat will quickly dissipate and it will remain only a few degrees above room temperature. However, in a thick buildup or cup, the low surface area to mass ratio will cause the epoxy to retain its heat, increasing its temperature. This results in a faster cure causing more heat. This unstable reaction is called an exotherm. Exotherm temperatures can easily exceed the maximum allowable for foam (200°F) and damage the foam-to-qlass bond. .....Unwaxed paper cups are used for mixing and ratioing resin and hardener. Convenient 8-oz cups for resin are provided. The hardener cups are the 3-oz unwaxed bathroom paper cups. Don't use waxed cups; the wax will contaminate your epoxy. .....If you are using the homebuilt balance, follow this procedure. Place the resin (8 oz) cup on the right cradle. The resin cup can be either a new clean cup, one with a little uncured epoxy left in the bottom, or a clean cup from a previous layup with hard epoxy in the bottom (smooth, not lumpy). Now, take a clean 3-oz hardener cup - pour a splash of hardener into it then scrape the hardener back into the container. This gives the hardener a wet surface, so its remaining hardener will not be counted in the balancing. Now, place the wet hardener cup on the scale, check that it swings freely and balance it perfectly by moving the small weight. Epoxy is then poured into the 8 oz cup (6 oz or less). Hardener is then poured into the 3 oz cup at the other end of the balance until the arm is level. When ready to mix, pour the hardener into the resin cup and mix completely. If you have the ratio pump, you simply put one cup under the spout, pump out the amount that you wan4 and mix. .....Mixing is done by stirring with a stick, being careful not to spill any. If you spill part of an unmixed cup, the ratio of resin and hardener may be inaccurate and it shouldn't be used. Mix each cup for at least two minutes. You should spend 80% of your mixing time stirring the cup and 20% scraping the sides to assure complete mixing. Do not mix with a brush. The bristles can soak up the hardener, changing the ratio. Use a tongue depressor or wood stick. .....The working temperature has a substantial effect on the pot life and cure time. Very hot conditions will cause the cure to speed up. In cold working conditions the cure will be delayed and if it is cold enough, epoxy may not cure at all. Working temperatures must be between 70° and 9O°F. A range of 75 to 80°F is best. Be sure to get a wall thermometer (approx. $1.50 at any general store) to check the temperature of your work area. At 75°F, 5-Min must be used within four minutes, and Safe-T-Pox must be used within 20 minutes. .....Cold epoxy results in increased tlme required to do a layup, since it takes longer to "wet" and to squeegee the cloth. A layup at 65° may take almost twice the time as at 75°F. On most layups (except for joining foam cores) its best to have 75 to 80°F room temperature and 80 to 9O°F epoxy. Resin and hardener can be kept warmer than room temperature by keeping it in a cabinet with a small light bulb on. DO NOT store your resin or hardener on a cold floor if you plan to use it within the next several hours. If YOU let your shop get cold between working periods, keep some resin and hardener in the warmest place of your house for use on the next layup. .....Save your mixing cups, as they can be used as a quality check of your epoxy. After a day or two take a sharp knife point or scribe and scratch the surface of epoxy in the cured cup. If the epoxy cured properly, the scribe will make a white scratch mark. If the epoxy hasn't cured, the scribe will make a dull ridge, indicating a soft surface. If this occurs, the epoxy has not cured, either due to inadequate time or temperature, or bad mixing, or bad epoxy. ..... Microspheres are a very light filler or thickening material used in a mixture with epoxy. 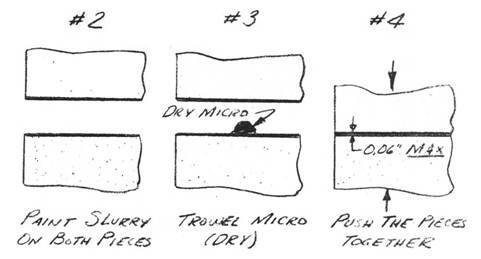 Micro, as the mixture is called, is used to fill voids and low areas, to glue foam blocks together, and as a bond between foams and glass skins. The glass bubble-type supplied is lighter than most common types. Microballoons must be kept dry. If moisture is present it will make them lumpy. Bake them at 250°F; then sift with a flour sifter to remove lumps. .....Micro is used in three consistancies; a "slurry" which is a one-to-one by volume mix of epoxy and microspheres, "wet micro" which is about two-to-four parts microspheres by volume to one part epoxy, and "dry micro" which is a mix of epoxy and enough microspheres to obtain a paste which will not sag or run (about five parts-to-one by volume). In all three, microspheres are added to completely mixed epoxy. .....You do not have to accurately mix the microspheres; just dump them in until the desired consistancy is obtained. Micro slurry is used to paint over foams before glass cloth is applied over them. Slurry is almost the same viscosity as the pure epoxy and is runny enough to apply with a brush. However, the easiest way to apply slurry is to pour it onto the surface and spread it out evenly using a squeegee. When skinning urethane foam use a full thick coat of slurry. Inadequate slurry on urethane can result in a poor. skin bond. Wet micro is used to join foam blocks, and, while it is much thicker than slurry, it is still thin enough to sag and run (like thick honey). Dry micro is used to fill low spots and voids and is mixed so that it is a dry paste that won't sag at all. In all three micro types, you don't measure, just add microspheres until the desired consistancy is obtained. Use micro only as specifically shown - never use micro between glass layers. .....Always use the following method to join foam blocks. This is extremely important. 1. Check that the foam blocks fit closely together. If there are voids over 1/16 inch, sand to fit, or fill the void with a sliver of foam. 2. Paint a light coat of micro slurry on both surfaces. If joining foam to fiberglass,paint pure mixed epoxy (no microspheres) on the fiberglass surface and micro slurry on the foam surface. 3. Refer to the sketch and trowel wet or dry micro in the center of the joint. Thus when joined the micro is pushed outward expelling (rather than trapping) air. If the fit is excellent use dry micro. 4. Push the two pieces together, wiggling each to move the micro toward the surfaces. Be sure the micro is no thicker than 0.1 inch at any place, to avoid exotherm. Wipe off any excess. Do not be concerned if the micro does not completely reach the surface. That void can be filled immediately before skinning the part.